I just finished a guestbook for two of our friends that are getting married in Richmond next Spring. It's not just any guestbook - this one will be completed using thumbprints! Trevor and I used this idea when we got married, and we love ours. 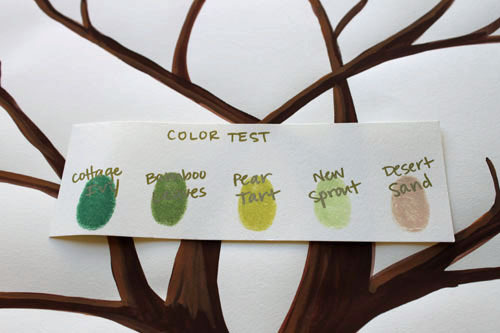 With the kit above, Alex and Holland will ask their wedding guests to make a "leaf" on the tree using their thumbprint. The guest can then sign their name in gold pen. I included this swatch of watercolor paper with sample thumbprints and writing so that Alex and Holland could choose their favorite ink colors. I based the lettering off of a font that Alex was considering for their invitations. I think Alex and Holland's guestbook will look fabulous! Thankfully, I asked the framer to leave the back of the finished product accessible, so I could still get to the original watercolor paper. It came in handy this weekend when my Maid of Honor and in-laws visited - none of them had signed the guestbook on our wedding day! I was glad they were still able to make their mark. I'll offer these on my etsy site at some point soon... until then, contact me if you're interested in one of these for your own wedding!